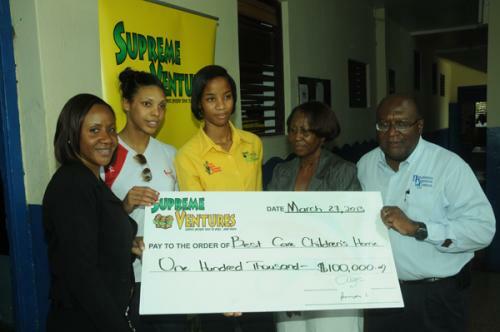 Supreme Ventures Limited (SVL), title sponsor of the 2013 Supreme Ventures/Jamaica Netball Association Sunshine Series, in collaboration with Jamaica’s Sunshine Girls have made a contribution of $100,000 to the Best Care Children’s Home (Home for special needs children), during a tour of the Trevennion Road based facility in Kingston. 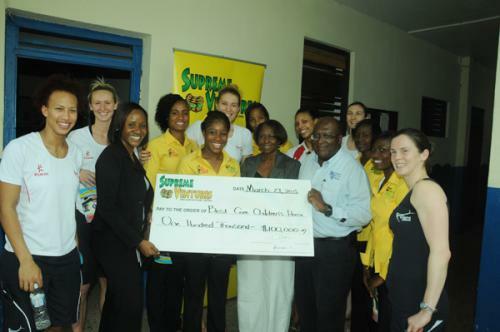 Best Care Children’s Home was selected to benefit from this monetary contribution as a reward to the participant’s who will be showcasing their skills in the Celebrity versus Master’s Netball game and the Corporate versus Media Shoot Off. This match will be held on April 6 during the Supreme Ventures/JNA Sunshine series. The three-test Series will be contested between Jamaica’s Sunshine Girls and England on April 2, 3 and 6, commencing at 7:30pm daily, at the National Indoor Sports Centre (NISC). The Celebrities that will be matching skills with a select Master’s team include: The Honourable Natalie Neita-Headley - Minister without portfolio responsibility for Sports, Media Darlings - Khadine ‘Miss Kitty’ Hylton, Jennifer ‘Jenny Jenny’ Small, Kerie-Ann ‘Kiki’ Lewis, Tricia ‘ZJ Sparks’ Spence, Paula- Anne Porter-Jones, Dahlia Harris, Nadine McLeod & Patria Kaye-Aarons; former Beauty Queens - Terri-Karelle Reid and Yendi Phillips; Entertainers - D’Angel and Cameal Davis; Olympian Grace Jackson; Publicist Carole Beckford; Marketers - Tanya Lee and Claire Grant and University of the West Indies Lecturer Dr. Sonjah Stanley.